The oak tree that gave the ranch its name dominates the landscape around the Broken Oak Ranch. It's beauty can be appreciated during all seasons. At Broken Oak Ranch, home of Judy and Larry Murfitt, horses and riders of all disciplines are welcome. We provide many services which include boarding, show preparation, breeding, and sales. The Broken Oak Ranch invites you to visit us soon! We enjoy visiting with people who have a passion for horses. Earned High Point Jr. Western Pleasure and Reserve High Point Amateur Western Pleasure title in the 2008 Southern Indiana Paint Horse Club. 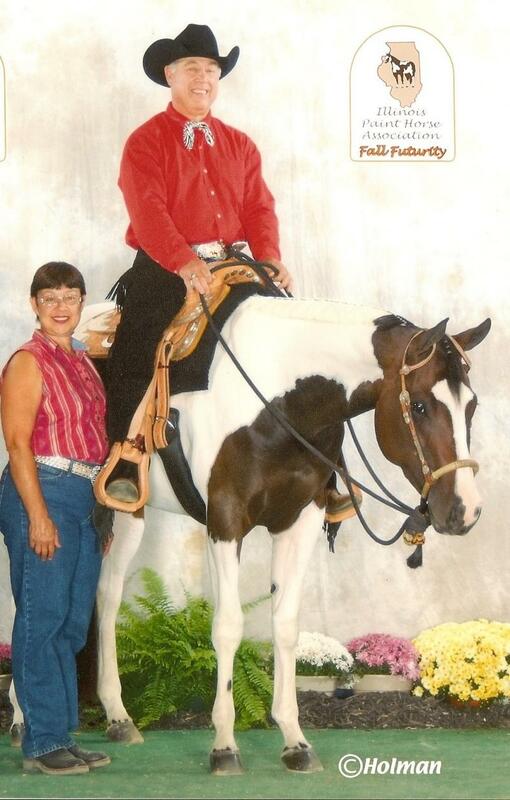 During the 2009 Indiana Paint Horse show season, "Me Me" earned High Point Horse in the Halter/Color class and ranked second in Jr. Western Pleasure. Me-Me is double registered in the Paint and Pinto Associations. We are excited to welcome her first foal in May 2014. The site of our beautiful ranch was purchased in the spring of 2001. The property consisted of a large cornfield and an oak tree. We built the barn and quickly moved in our family horses. THEN we began construction on our ranch house. We had our priorities in order then and we have the same priorities now - the horses come first! When the oak tree broke . . .
"A mighty wind blew night and day. While working at the property one day, a terrible storm with whirling winds moved in. We quickly gathered our tools and fled for safety. We thought a tornado was about to hit. When we returned, we saw no damage to our construction site. A few days later, on a bright and sunny summer day, we were working on the house when we heard a thunderous boom. We thought it might have been a car crash and went toward the road to check. That's when we noticed the tree. A large middle limb of the huge oak in the cornfield had broken and fallen to the ground, creating the tremendous crash. The limb was the size of most trees found in Indiana. The strong winds of the storm the weekend before had weakened the branch that finally gave way under its own weight. A third of the tree was gone, and it was uncertain if the tree would survive. People passing by who were familiar with the old oak tree stopped to ask about it. They said it was an area landmark. It was so beautiful and majestic standing alone in the middle of the corn field. Thankfully, the oak - though broken - survived and is alive and well to this day almost a decade later. The tree is a testimony to the resiliency of nature and an inspiration for the human spirit. Broken Oak Ranch LLC. All rights reserved.